Stuck with creating that first invoice for your business? Congrats! 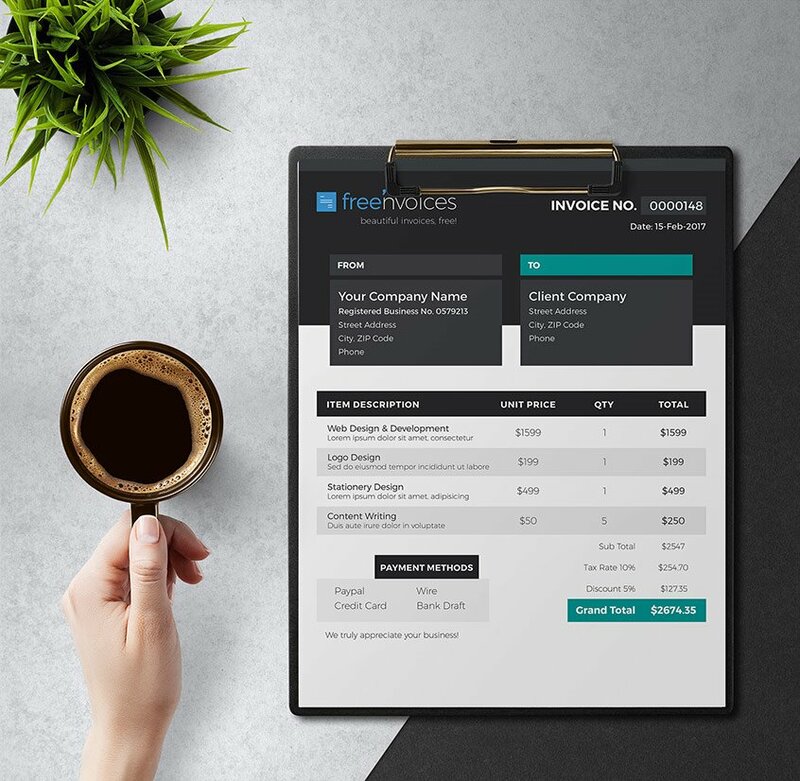 You are at the right place because we have both of these things here – free, awesome and professional invoice templates to pick and put to action. 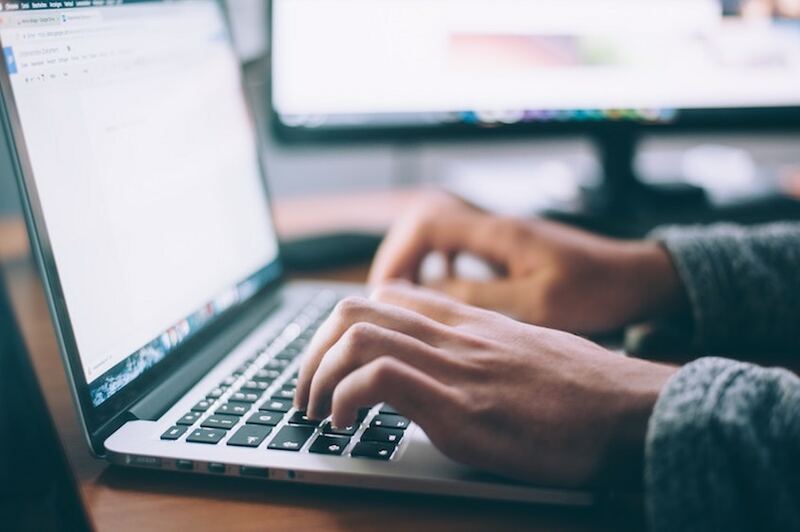 The first point it’s kind of obvious – it’s always easier to customize a premade template up to your needs, instead of staring at a blank screen and trying to figure out where to begin. Our templates already come in a variety of attractive styles and color schemes. Forget the awkward font pairings, and mismatched columns – everything is already designed for you and polished up for perfection. 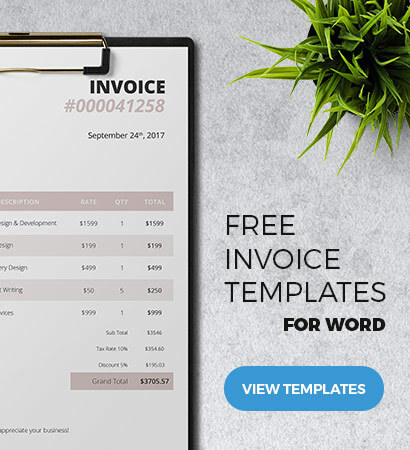 Using a professional looking invoice template also adds a nice “pro” flair to your business. You no longer appear like an amateur – filing a boring, “black on white” template. Those can easily get lost in a pile of similar-looking documents, resulting in delayed payments. Finally, filing professional invoice templates makes your accounting oh-so-much easier. You can store a copy in your “shoebox” (digital or physical) and create special code systems that will help you keep track of your cash flow. Without further ado, here are the best sample invoice templates you can download today (and customize up to your needs using our tips at the end of this post!). And here’s the best part – all of our templates are available for free in multiple formats. Invoice template PDF? Checked! MS Word Templates? Yes, please! Want to print any of them? Be our guest! A clear breakdown of provided services + prices. Download, customize it in Word and print as many copies as you need. This template commands more attention and authority. The darker color scheme we have chosen oozes professionalism. Suitable for small businesses who want to appear “larger and corporate” or those who want to extend their lux customer experience to invoices as well. Unlike the previous one, this chic client template also includes an additional graph in the breakdown section to indicate “Quantity” – an important parameter for those providing bulk services or selling products. If you want to add a touch of femininity and elegance to your invoices, this template should be just right for you. Again, you can instantly download it and customize all the sections. The white space at the bottom can be used to add a quick & lovely personalized note to your customer. Or use it to include a quick recap of your invoice payment terms. Did you know that green is not only an “eco” color but also communicates competence? According to Stanford professor Jennifer Aaker, green closely aligns with the following traits “intelligent”, “reliable” and “successful” when it comes to brand perception. That sounds just like your business, right? Well then, don’t search any further and grab this invoice template! It’s yours in one click. Customize it and print it out or send as PDF doc. For when you just need a very simple invoice template…and no frills. This one will perfectly do the trick. Just punch in all your business details and dispatch it to your customer. Thanks to a “smart” choice of fonts this template looks official enough without being just too plain and personality-less. Here’s one for those businesses who love to be a bit avant-garde and make a statement, even when it comes to their invoices. The red & black color combo makes this template look modern, bold and highly authoritative. I bet it won’t fall through the cracks on someone’s desk! Do you want to please your clients with something bright and squeeze out a quick smile? 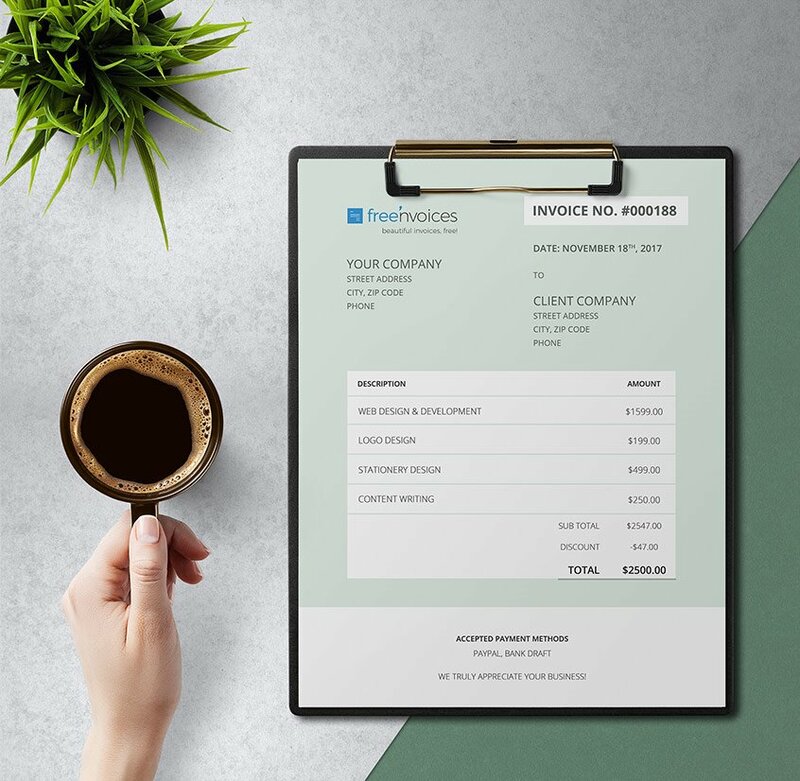 Than this invoice template is up your alley. 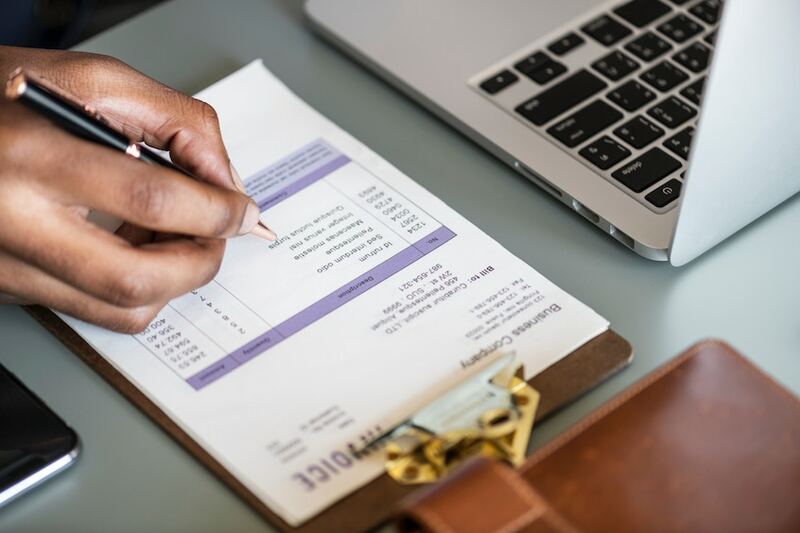 Those splashes of yellow instantly draw attention to the most important areas of your invoice – accepted payment methods, due date and grand total to be settled. 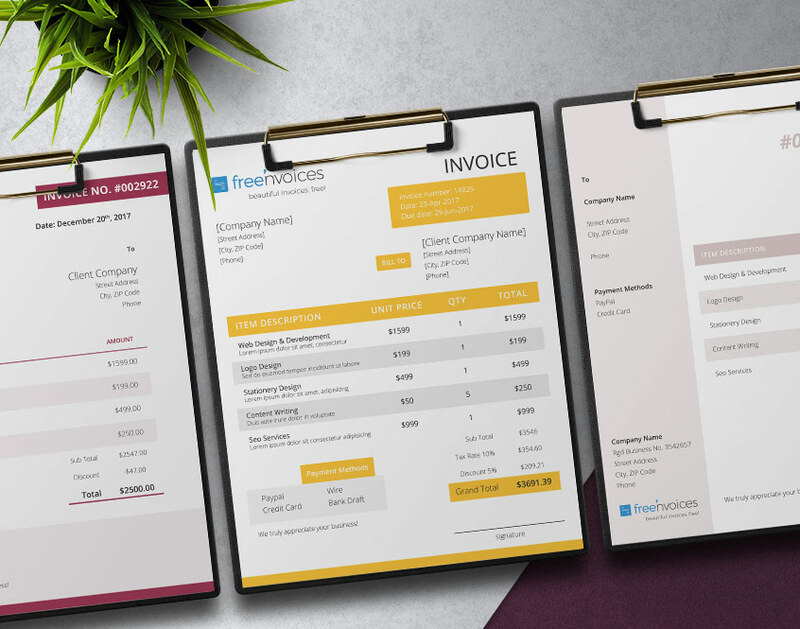 This gleaming invoice template is available for instant download on our website and can be tweaked in Microsoft Word up to your liking. How about adding some slight bling to dazzle your clients one more time? Our signature Golden Touch template has a slight luxurious flair and a laconic layout – all the key information is prominently visible on white background. Make quick edits and file it to that “special” client of yours! Last, but by no means least…is this gorgeous invoice template with two quick purple lines, just to make it a tad bit funkier. Again, all the essential invoice sections are included and prominently visible. In fact, we played with colors a bit to make some entries at the services breakdown section more visible. Excellent choice for freelancers, entrepreneurs, small business owners and anyone in between. Finally, it’s an absolutely free template in Microsoft Word format, just like all other ones on this list! First, let’s throw out some technical formalities out of the way. Every template is delivered in zip format and contains multiple files. You should have no issues with opening it as most operating systems have inbuilt file extractors like WinRar. So if you cannot open the downloaded archive for some reasons, make sure that you indeed have a suitable utility installed. We have also included some quick instructions for customizing your template and downloading custom fonts (also available for free!). Lastly, our invoice templates are compatible with Microsoft Word (2007 or higher). So they may not be properly supported by older versions or other word processors e.g. Pages or Google Docs suite. Now onto the more interesting part – customizing all those standard invoice sections. Invoice number. You can go sequential and just style your invoices as 00001 and so on. Or you can “code” additional details into that number. For instance, add the client’s initials before the number (CB-00001) for convenience. Don’t be too descriptive with services/products break down. There’s no need to “overload” your invoice with such details. All the nuts and bolts in regards to the work scope should be mentioned in your project proposal. Don’t forget about your payment terms! Or you risk your invoices being made late. 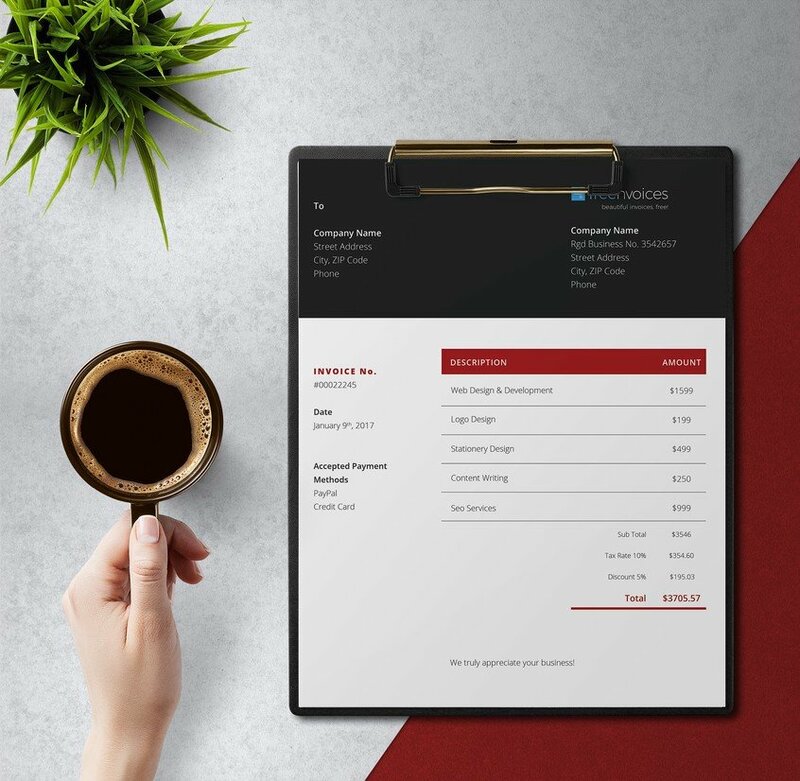 Add your logo to make your invoice instantly recognizable and on brand. For more tips be sure to check out full-length post: How to Make an Invoice For Your Business (with Examples).